Report from Guido Fawkes site. News about the unverified dossier have gone round the world a few times by now. 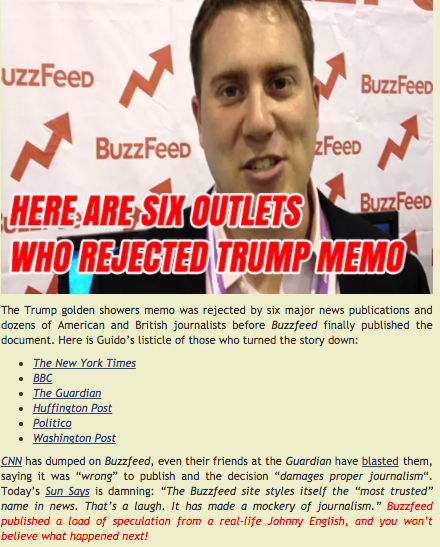 Buzzfeed, the site that decided to go public with the "report" produced by Fusion GPS, certainly hasn't covered itself in glory: some of the most reputed liberal media outlets (BBC, NYT, The Guardian and WaPo) refused to touch it, even though they'd love to claim Trump's scalp. There's already some talk about the similarities between Hugo Chavez and Donald Trump, especially in the way the president-elect treats non-compliant media. But I digress. "We’re hoping that people who have an interest in bringing things out, to do something about corruption, fraud, will come to us." Well, if attempting to destroy Republican donors -or its perceived GOP enemies- doesn't work, there's always a gig to be had with the Democrats. It does crack me up however, to read, in The Guardian no less, stuff like: "Fusion GPS, led by former journalists skilled in digging up secrets on public figures." Skilled? I know better. Fusion GPS were (may still be?) in the employ of Derwick Associates, without a shred of a doubt one of the most corrupt group of thugs ever to have come out of Venezuela. The sort of "businessmen" that have no qualms in stealing over one billion USD from an almost destitute country. Fusion's "former journalists", of course, don't have a problem with corruption, so long as billable hours keep adding up. Glenn Simpson managed to get a few quid from the Derwick thugs. He dispatched his sidekick Peter Fritsch to Caracas once upon a time, along with another equally contemptible and disgusting former "prosecutor", basically to impede journalists from carrying on with, erm, corruption reporting. 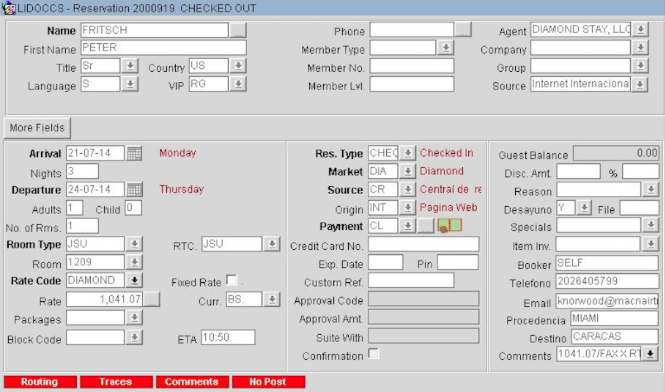 Fusion GPS's Peter Fritsch's record of visit to Hotel Lido in Caracas in July 2014. I happen to know one of the "skilled" journalists at Fusion GPS, Tom Catan. He covered Venezuela's 2006 presidential race for The Times of London, and as I was shadowing the opposition candidate, I was asked to organise an interview. We met a few years later, in Spain, when, again, I helped with another interview. I invited the guy to my house for dinner, we broke bread together, talked, had a few drinks with my family... He seemed, then, a decent enough person. Imagine my surprise when I found out that his firm was retained to destroy me on behalf of Derwick Associates. I confronted him with the kind of tactics they so readily employ with their targets. His reply dispelled my doubts as to his integrity. But then, Derwick thugs decided to crank it up a little. My family was the subject of illegal surveillance in London. We were photographed going about our daily affairs for months. The operation culminated with a break into my flat, theft of my laptops, and threats of sexual abuse against my daughters. Now that I read about Simpson's connection to a former British MI6 agent, I wonder: did Fusion GPS participated in the attack against my family? Did it subcontract former British intelligence officers to track me down in London? To be frank, I doubt that British spooks -regardless of how spineless and money driven they may be- could be as inept as to allow themselves to be caught in CCTV in the process of carrying out criminal activity. However, it is entirely feasible -considering its clients- that Fusion GPS asked its British counterparts for my whereabouts, and once determined the information was passed along to other more (let's say) blunt operatives, who may have been sent from Venezuela, or Spain, to assault my flat in broad daylight. I will carry on digging, though I guess, for really skilled hacks like Fusion's, there's always the possibility of joining Russia Today, or better yet, Wikileaks. The story about Venezuelan monumental corruption is, still, to play out. One thing seems certain though, when it does, Fusion GPS hacks will find impossible to justify their association with criminals. Addendum: just read this morning a piece by David Satter, regarding Fusion GPS's and Christopher Steele's kompromat fabrications, which included "reporting" Trump having been filmed with prostitutes, doing "golden showers", etc. Did I mention that whoever masterminded the attack against me also took the trouble to spread online totally unsubstantiated stories about my alleged "connection" to drug trafficking, extortion, car theft, and (a Russian favourite) "involvement" in paedophilia? The most implausible of all was of course an accusation regarding my mother, who having died of cancer in 1983 was somehow revived and placed, by my creative accusers, as the leader of a drug cartel in 2006!